“It’s about time you applied what you are observing and hearing within the herd” said Rhett. “Give me a little time Rhett, this is a mindset that has eluded me, obviously, for my entire life of horse experience.” “Try being a horse living in a human world” Rhett mused. Sage is carrying on quite a ‘conversation’ standing between Jack and Louie isn’t she !!??!! 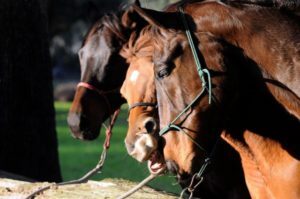 “‘Conversation’ is the informal exchange of ideas by spoken words.” Horses don’t have spoken words, their words are made up of body language. The body language that Rhett showed wasn’t characteristic of what I was used to seeing in horses. This was a horse that had, seemingly, a ‘mental blip’ upon first observations. That wasn’t it at all . He was to teach me that language, that subtle vibration between two minds and two hearts. The opposite of ‘conversation’ is silence and silent was the last thing Rhett was being. He was screaming with his body language, his mind and his energy and no one had ever listened or didn’t understand his conversation or language, so he had no choice but to scream louder and louder until he felt forced to move directly into defending himself…fight! The first ‘conversation’ that Rhett and I shared were the barn rules. 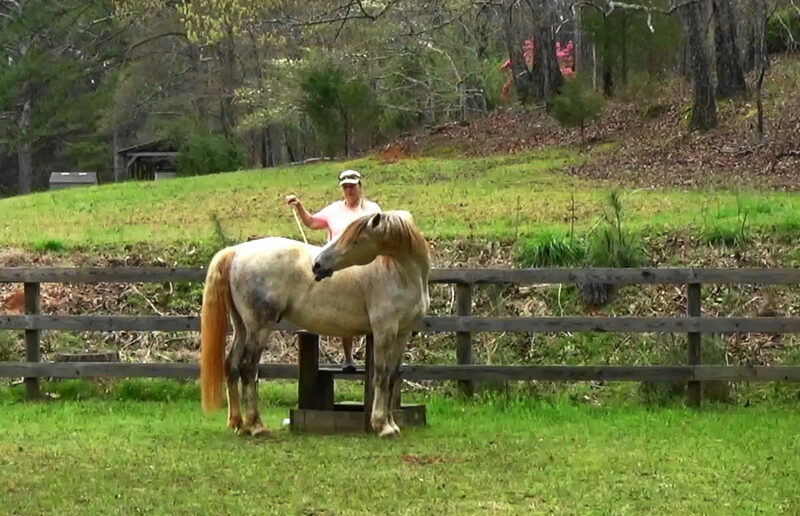 I had feeding ground rules that needed to be laid down, habits and patterns that needed to begin to form for everyone’s safety, including hubby, who Is NOT a horse person! 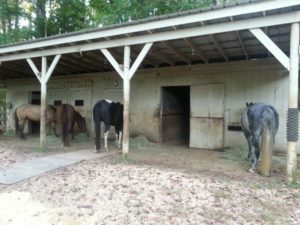 I now have 4 horses and 3 stalls, however, Rhett is too claustrophobic to stay locked in a stall for any length of time. The rest of the routine at the barn needed to stay the same and Rhett worked into that routine. Easier said than done! 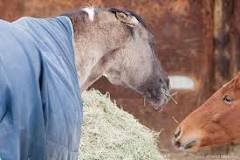 Sage felt that every square inch of the barn and the barn paddock belonged to her, and while she’d share with Koda or Sarah, she would not share with the intruder. Mares have big bubbles, Sage’s is particularly large in this situation. 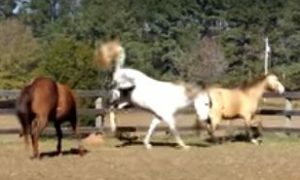 I had never had a horse that went directly into fight so my response was, well…to be honest, I really don’t remember what my response was the first time I had to get away from him when he felt he was pushed too hard. Loose in a new environment with a swirling stick and string was perceived as a lot of pressure. Clearly, any type of rope and rope on the ground presented pressure and he truly was terrified to the point of freezing, and then he would go into fight if made to go near the rope. I was determined to allow him to voice his opinion about the matter and it was clear he had something to say. Rhett was lightening fast with his reactions if a horse came into his HUGE bubble while he was eating. Sometimes, the reaction came in fast with his head, neck and teeth and sometimes it was his rear end. In addition to being aware of Rhett, I needed to also bring the rest of the herd into the observation picture. This was invaluable in learning to read Rhett’s awareness and observations of his reactions (not responses) to pressures. Pressure from the environment, from the ‘task’ being requested, from the human and, innately, from himself to himself. 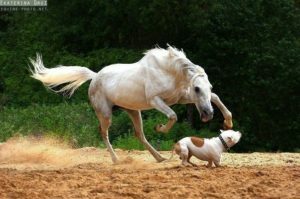 (The Four Elements of Motivational Horsemanship). It only took a couple of days for me, Rhett and the herd to come to an understanding of the barn rules. 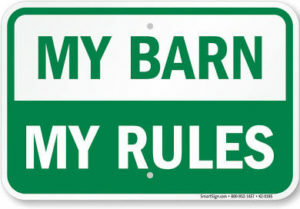 I really only had only two ‘barn rules’ – 1. Watch out where the human is at all times and 2. Watch out where the human is at all times. I found that ‘over inflated egos’ in myself OR Rhett wasn’t in either’s best interest. So I relaxed the attitude attached to the word ‘rule’ and changed the attitude and word to ‘guideline’. That sounds and feels more like we are working towards something together, respectively. Things changed after that adjustment on my part. Rhett became less defensive of his space and that was the very beginning of our beginning “heart-to-heart’ conversations. “It’s about time you applied what you observing and hearing within the herd” said Rhett. 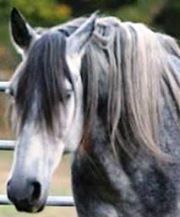 “Give me a little time Rhett, this is a mindset that has eluded me, obviously, for my entire horse life experience.” “Try being a horse living in a human world” Rhett mused. Wow, is this what perspective he already holds of humans?